You are here: Home / News / Robert Griffin III, quarterback of the Washington, D.C. Professional Football Team will have a huge season, don’t doubt that. Robert Griffin III, quarterback of the Washington, D.C. Professional Football Team will have a huge season, don’t doubt that. 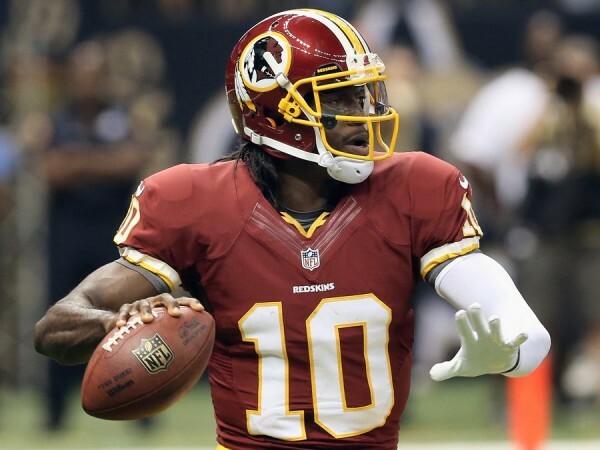 (ThyBlackMan.com) Robert Griffin III or RGIII as he is sometimes better known as, will begin the 2014 N.F.L. season as the starting quarterback of the Washington Professional Football Tea,m. There’s no doubt about that, the doubt however is more or so aimed at his current status as Mr. Football in the nation’s capital. Yes, the same abilities that allowed him to come into the league two seasons ago with Adidas and Subway sponsorships following his Heisman winning season at Baylor and lead the team to the playoffs are under close scrutiny. Griffin hasn’t played well thus far during the pre-season, add that to last year’s debacle and you have a recipe for what is now taking place: quarterback doubt. Will a healthy Robert Griffin III be what once again lead his to the playoffs a la 2012? Or will he forget to slide after a ten yard run down field and suffer another big hit? Will he overthrow a receiver after forcing a throw between two opposing defensive backs? Those questions are all valid and if you know how the people of the DMV (D.C., Maryland and Virginia) feel about their football team you’d know that they would have doubt following a Super Bowl victory let alone a losing season. Well that was then, HE is the now and I just can’t see how he doesn’t succeed. Dear Washington professional Football fans, you need to see that too. Following knee surgery and a rough-to-say-the-least 2013 season for both he and the team the Washington ( reader: add team’s less racist name here) will have very low expectations coming into this current campaign and that is why both he and his squad (NOTE: I will not now or ever type the team’s original name in any column that I write) will have a great year. No, let me change that, Robert Griffin III will have a great season-I’m predicting record highs in touchdown passes, passing yardage, completion percentage and most importantly he will lead his team to the playoffs. There’s is no particular science behind my albeit educated opinion, I just think the kid is finally healthy, 100 percent healthy for the first time since his rookie year. Add that to the fact that he has had to either watch from the sidelines injured, benched (Thanks to the Shanahans-ex head coach Mike and his son/offensive coordinator Kyle) or both and it is safe for me to believe that his overall professional football brain is at it’s peek. Robert Griffin III should be coming into this season with a Washington Monument sized chip on his shoulder. If nothing else he has to be playing to prove to himself that he is as good if not better than he was as a rookie. I’m willing to bet in print that he is. HOW EASY THEY FORGET. The same team that went 3-13 last season and finished dead last in the NFC East was a division winner in 2012 behind an award winning Robert Griffin III rookie performance-20 td’s and only 5 INTs in 15 starts. Griffin’s 815 rushing yards and seven touchdowns during that season look hall of fame caliber compared to the 489 yards rushing and 0 touchdown tally he had last year. Clearly Robert Griffin needs to be completely healthy to duplicate and surpass his rookie year but I believe that is the only thing stopping him from reliving the success Washington had. It is a big thing nut not impossible. What some believe is a weakness-his -is what makes RGIII special. That gift of improv is the difference between he and the other starting quarterbacks in the NFC East. None of the other signal-callers can move like Griffin. None of them have the arm strength of Griffin. What is needed in order for Washington to win is at hand. Now all Robert Griffin III has to do is gather all of his skills together in a nice and neat 16 game package for all of the world to see. Easier said than done, yes, but definitely doable. THE STEREOTYPE. Recently legendary Washington quarterback Joe Theisman had been quoted by ESPN’s Adam Schefter in a recent piece as saying that the team should be starting third-year backup quarterback Kirk Cousins instead of Robert Griffin III. That’s the equivalent of saying you should be watching the Super Bowl on your laptop screen instead of on your 50-inch television. You go to war with the best and most capable weaponry available at hand-Robert Griffin III is the Washington football team’s best offensive weapon. The Washington Football Club opens the season on September 7 at Houston. With the Texans lining up J.J. Watt and rookie Jadeveon Clowney on either end of the defensive line who else would Washington want behind center? The immobile Cousins or the even on a surgically repaired leg I’m one of the best athletes on the field Robert Griffin III? I think the answer to both of those questions came two years ago on draft night. Griffin, the second quarterback taken overall behind the Colt’s Andrew Luck. THE PREDICTION. This season under Robert Griffin III’s leadership the Washington Blanks will once again win a double-digit number of games. The competition in their division is prime for another takeover. The Giants don’t look especially different, the Cowboys are what they always are: dangerous on paper only. And the Eagles will be without their best wideout Desean Jackson who just so happens to be catching passes from…you guessed it Robert Griffin III. The stars are alined for the Texas native to have a big season (How’s that for a start? A week one homecoming game?) and I just can’t see how that’s not going to happen. I just can’t see how he and by direct association the Washington Professional Football Team doesn’t succeed. Don’t doubt that. One may also connect with this talented writer via twitter; Suggswriter and also facebook; D. Suggs.